Game of Thrones actor Chuku Modu has been cast in the upcoming Captain Marvel, according to a new report. Production on the highly anticipated Marvel Cinematic Universe project wrapped last week, which was announced by stars of the film, including lead actress Brie Larson, who posted a picture of the clapperboard over a full production calendar. Captain Marvel will now enter the post-production process and will more than likely have to take care of some reshoots before the March 2019 release date. 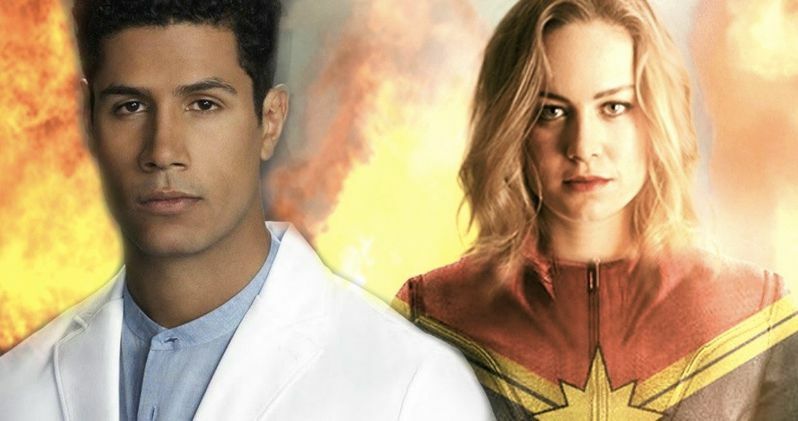 The role Chuku Modu plays in Captain Marvel is currently under wraps and there has been some speculation that he could be playing a friend of Carol Danvers or even a member of the Kree or Skrull armies. Modu is best known for starring in the first season of The Good Doctor as Dr. Jared Kalu. He previously appeared as Dothraki warrior, Aggo, in HBO's wildly successful Game of Thrones as well. Modu has yet to comment on the casting, but that is more than likely due to the tight ship that Marvel Studios runs. We'll just have to wait and see who Modu ends up as when the movie hits theaters. Now that production has finally wrapped on Captain Marvel, MCU fans are impatiently waiting for a trailer announcement. However, Marvel Studios boss Kevin Feige has said that it will be a while before we get to see the trailer for the film. It was believed that the first footage was going to be shown at the CineEurope convention a few weeks back in Spain, but that was not to be. While it's going to be a bit before the we get to see Brie Larson as Carol Danvers, we could possibly end up seeing the trailer sometime this fall, if the studio continues a similar schedule that they used for Black Panther. As for what's next in the MCU, Kevin Feige teased that we could end up seeing another 10 years and 20 movies added to the next phase. Avengers 4 will hit theaters after Captain Marvel and it will serve as the final movie of Phase 3 of the MCU. Phase 4 will start with 2019's Spider-Man: Far From Home and 2020's Guardians of the Galaxy Vol. 3, and it will see Carol Danvers taking on a similar role that Tony Stark played in the first 3 Phases of the MCU. Captain Marvel opens in theaters on March 8th, 2019 and it's believed that Carol Danvers will have a large role to play in Avengers 4 and tying the Quantum Realm from Ant-Man and the Wasp together for the film. The Russo Brothers are currently editing the fourth Avengers movie and they're doing an amazing job making sure that nothing leaks about the storyline. While we wait to see how Carol Danvers takes the MCU by storm, you can check out the casting of Chuku Modu's role in Captain Marvel over at IMDb.